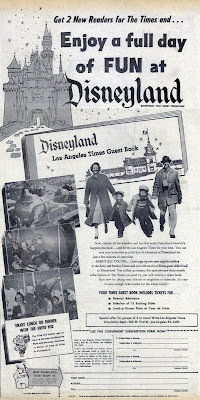 Back in 1957 the Los Angeles Times had a special offer for fans of Disneyland. Get 2 New Readers for The Times and get a free “Los Angeles Times Guest Book” to Disneyland. Convince two of your friends into a three month subscription of The Times (at $2.25 per month) and you get admission to Disneyland, a selection of 15 exciting “rides” and a free meal at Casa de Fritos! This first advertisement is from February 24, 1957 and it’s HUGE at 22 inches high – have you seen The Times lately, its not so big anymore. This advertisement is just as tall but a third less wide and its from January 31, 1957. Basically they same advertisement but this one talks about a “Extra Bonus Offer” – a night stay at the new Disneyland Hotel! You can probably get these old ads in .pdf or .jpg, but the old paper is a lot more fun! Does anyone happen to have one of those L.A. Times Guest books??? These are great. I have some old newspapers that were given to me by a collector who didn't want them any more, and you are right... old newspapers seem huge by today's standards. Trip Report - November 6, 2010 - Inside CLUB 33!